What’s this? Typologically, it’s a stone wall. Taxonomically, let’s not worry. A classification that is easy-to-use, loosely defined, and often task-specific is called a typology. Essentially, this kind of classification relies on intuitive categories that may have little to do with appearance. Its subjectivity distinguishes it from a taxonomy, which is based on explicit, usually visible and measurable criteria from the object itself. The criteria are objective, for example height, width, or the presence or absence of some salient or diagnostic feature. 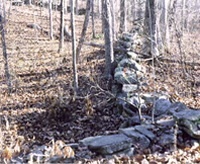 For a more rigorous stone wall classification, refer the Taxonomy in this website, or to “Chapter 9 – Classification” of Exploring Stone Walls. Wild wall in northeastern Mansfield, CT. 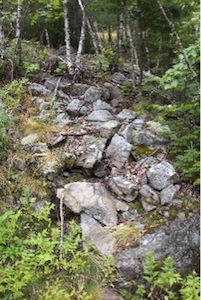 Abandoned walls, also known more affectionately as “wild walls,” are usually fairly old. They were at one time farmstead walls walls that have since become tumbled and unkempt. A very few of these (especially the oddest-shaped constructions) may be pre-European in age, but the burden of proof for this assertion lies on the person making this claim. Regardless of their original origin, abandoned walls have, by definition, become ruins. Tumbled and damaged, especially along the top. Covered by lichens and moss. Graveyard walls are a good example of heritage walls. This one is in Tolland, CT.
Often contain quarried stone, or large capstones not composed of quarried rock. Are the foundations of former buildings, known to have existed in the past. Surround known estates or land tracts. There would be public opposition if the wall were scheduled for demolition. Grace old roads, especially Yankee-era turnpikes. Mentioned in original historic documents (such as the town pound). 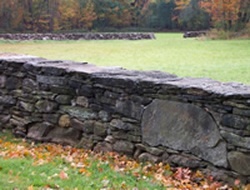 An expert amateur mason built this “rebuilt” wall in Woodstock, CT. This broad category contains two basic subtypes. Most common are those walls where an old, tumbled-down wall on a formerly derelict property have been rebuilt, usually in the same place, usually by the landowner or a mason hired to do the job under their supervision. Almost as common are generally shorter sections of “new” wall built on properties with stone imported to the building site. Ornaments to 20th and 21st century construction. Built of exotic (came from far away), rather than native, stone. Can be documented as recent in age. Are in the process of being built or rebuilt. Are known to have been built by a living mason. This is a tricky case. 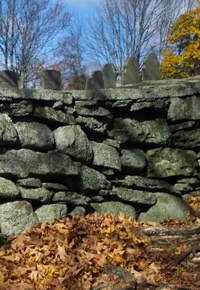 An abandoned wall now lies on the grounds of the Southern New England Botanical Garden in Boothbay, ME. If a stone falls down, will they replace it? I hope not.